Recently, Connie Phelan and I had the pleasure of facilitating a communication and board breaking session for NetJets Association of Shared Aircraft Pilots (NJASAP). In a room of 40 pilots, the four female NetJets pilots stood out. Had it not been for someone quietly telling us the background of an unassuming 60 year-old female pilot, we would have never known we were in the midst of an aviation legend. 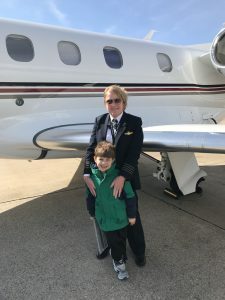 Margaret “Peggy” Dennis Carnahan is retired from the U.S. Air Force and currently a Captain for NetJets. 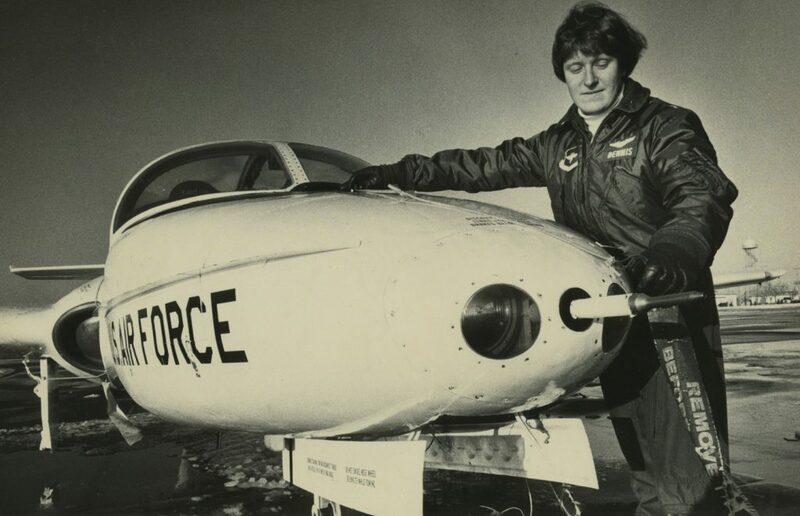 Peggy is a member of the 1980 U.S. Air Force Academy Class, the first to graduate women! She rose to the rank of Lieutenant Colonel, serving as an Air Force Instructor Pilot and Squadron Commander. Her awards include Air Training Command Master Instructor (1985) and Outstanding Young Women of America (1987). Peggy’s impressive bio is included at the end of this article. Being the first in anything is rarely easy. Each career path comes with its own set of challenges and the Air Force is no exception. Today Peggy is considered a trailblazer for women military aviators, but it almost didn’t come to be. Very early on in her career she began to realize obstacles she would need to overcome if she was going to have any success at all. We’re sharing Peggy’s story with our readers as a testament to what can be achieved if one is willing to break barriers, from within and without. Peggy, the sixth of seven children, grew up on a farm approximately 60 miles south of Chicago in a small town whose population was less than 3,000. Peggy was named after her grandmother Margaret, who passed away a few months before she was born. Her small town wasn’t big enough to have two “Margarets”, so she was given the nickname “Peggy”. Her father, an engineer and farmer, and her mother, a schoolteacher, set expectations for all of their children to attend college. Peggy’s brother who is five years older went to the Air Force Academy, and her sister, two years older than her, got a full Army ROTC scholarship to Arizona State. As Peggy was exploring her options, she spoke with the local insurance agent, who was her dad’s high-school friend. He was a Colonel in the Air Force Reserve and a local Liaison Officer. Peggy vividly remembers stopping by to see him on a Friday to pick up a letter of recommendation for an ROTC scholarship. He asked her to look at the Air Force Academy as on option, as President Ford had recently signed a law abolishing the all male tradition in military service academies. The only catch was that she needed to give him an answer by Monday! She was 17 years old, and as one might expect from the forward thinking of a 17 year old, she decided that it would be a good idea. Why not! Besides, she had the thought that mountains are prettier than cornfields! And, one of her male high-school classmates was going to attend as well. She would have an ally, though in reality she rarely saw him. Peggy struggled throughout her four years at the Air Force Academy, close to quitting several times. Eventually she realized she didn’t think beyond her decision to attend. Where were her four years going to take her? The Academy was challenging because of her mindset and lack of clarity. It took Peggy two years before she developed a mindset of “I want what this will give me; I want to be part of this group; I want these people to be my peers; I want to be one of them”. Today when she speaks with young people who are considering going into the Academy, she encourages them to consider what it will give them, and what their other options don’t, and to be sure that they want it! When Peggy entered the Academy, she knew she was there because the initiative of having women was mandated by Congress, but hadn’t spent much time thinking about what she wanted from her time spent there – what her future would look like. Flying was not an option when she entered; there were no female pilots at the time. The Air Force was just starting to test that possibility. Looking back, Peggy realized that she was presented with an opportunity, and to fully benefit from this, she had to be willing to want what they had to offer and to get through it! The whole emphasis in the Academy is teamwork. The basic training premise is to make the individual go away and build cadets back up as a member of a team where they are all the same. Competing against each other is a great way to fail. You can’t get through there by yourself. You do it as a team. You do it as a military unit. You have to take care of your roommate, you have to take care of people in your squadron, and you work together as a team. Because if you try to make it as an individual, you’re not going to make it. Peggy was in awe with the other women. Coming from a fairly sheltered small town, she didn’t even have girl’s sports in high school until her sophomore or junior year and then they had no uniforms. The girls had to buy their own t-shirts and use masking tape to make numbers to create their own uniforms. Coming from that kind of environment, she met other women who were playing soccer since they were six years old. Peggy was astounded with the other women’s backgrounds and talents. She was surrounded by superstars and found it eye-opening and humbling! 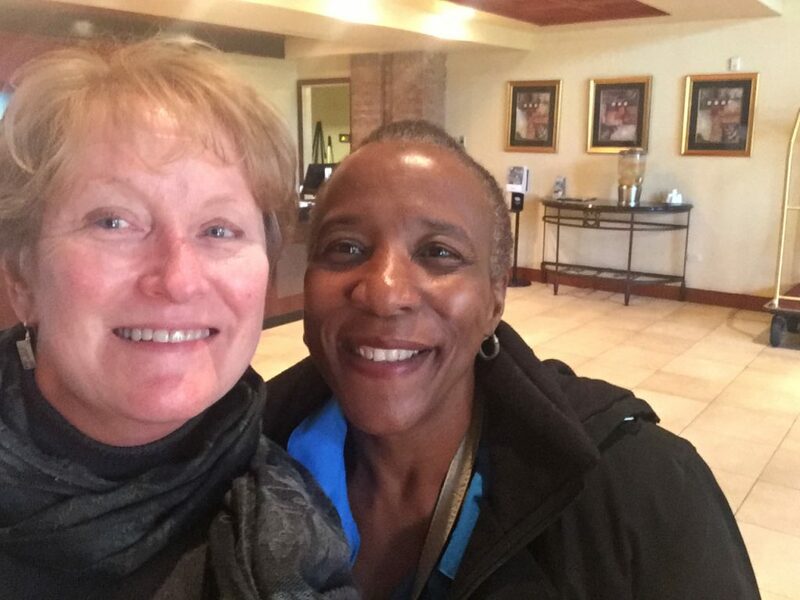 Captain Margaret “Peggy” Dennis Carnahan and Dr. Gwendolyn Knuckles at 2015 Class Reunion. Courtesy of Captain Margaret “Peggy” Dennis Carnahan. Peggy’s roommate in her upper class years was Gwen Knuckles, the daughter of an Air Force Master Sergeant. She had traveled the world and lived overseas, a very different upbringing from Peggy. But that was not the only difference in the two women. While Peggy continued to struggle, Gwen was excelling and enjoying her time in the Academy. Gwen was bound and determined she was going to medical school. Her focus and positive outlook had a huge influence and impact on Peggy’s own focus and looking ahead to the future, in terms of where she was going and what she was going to do. In Peggy’s words, “She was a lifesaver for me.” In retrospect, Peggy realized that Gwen wanted to be there, did not complain, knew why she was there and where the Academy was going to get her, was clear on what she wanted to do, and more than anything, had a positive attitude. From that point forward, Peggy began looking at the positive side of things, and gravitated towards people with positive energy. Gwen would go on to medical school and serve as a doctor in the Air Force. Peggy went into the Air Force flight school and began the next phase of her career – pilot training. At the time, there was a pilot shortage and women could officially go to pilot training, it was no longer a test program. There were only 26 women who were pilot qualified in her class, and they were still pretty much considered an oddity! Another factor in Peggy’s decision to go to pilot training was that her older brother did his pilot training five years earlier, and she wanted to show him that she could do it! Once in pilot training, Peggy’s mindset was one of determination and she knew what she had to do. She knew it would require a lot of work, concentration, and studying. And she was determined that if she didn’t make it, it wasn’t going to be for lack of effort on her part! She was not going to fail because she didn’t work hard enough. Positive mindset and focus! Peggy became the dedicated disciplined student she could have been previously, asking herself, “What can I really do?” She made sure she had set study time, sleep time, etc., making sure she did her part to ensure a successful outcome. And, in her words, “It turned out that I was actually kind of good at it and that I enjoyed it!” Peggy realized that the Air Force airplane recognizes talent. It doesn’t care who you are; it just cares about the skills of the pilot that has the controls. Peggy excelled in pilot training and stayed on as an instructor. The program has changed quite a bit since then with technology and new aircraft. 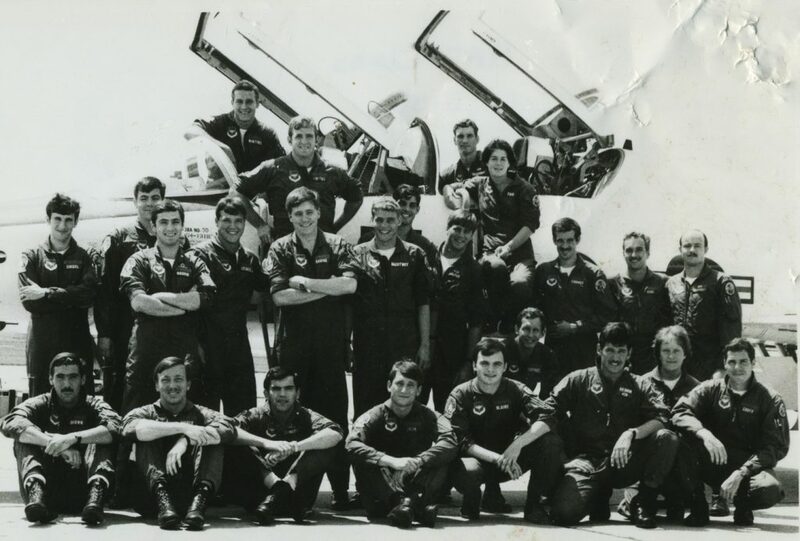 Then, it was a two-phase program where she flew T-37 for about six months and then flew the T-38 twin-engine tandem seat supersonic jet, which is still in use for pilot training. 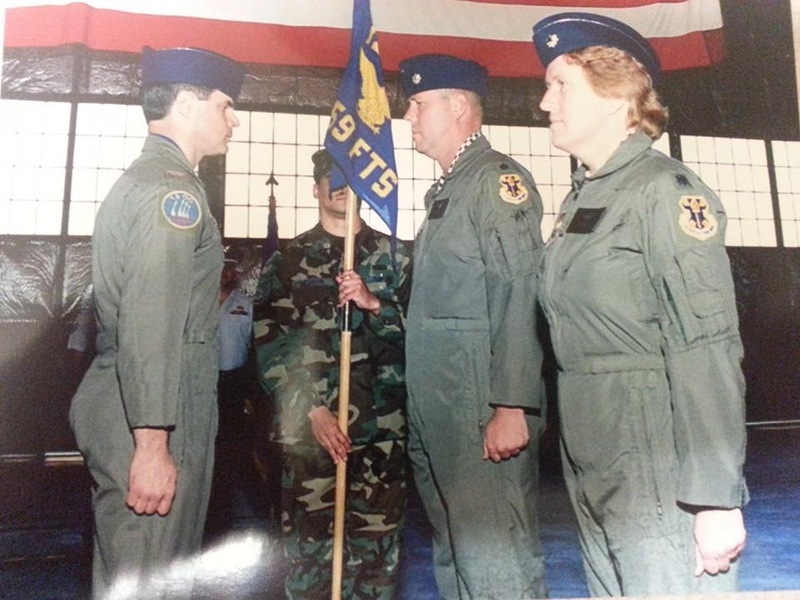 Taking command of the 559th Flying Training Squadron at Randolph AFB TX, May 1997. Courtesy of Captain Margaret “Peggy” Dennis Carnahan. 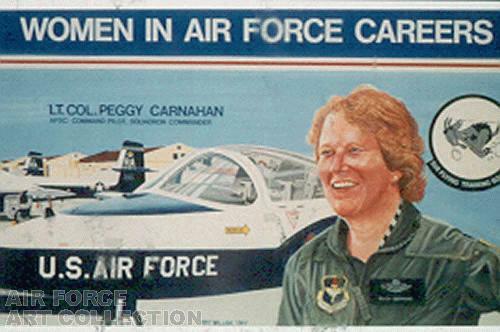 Additionally, when women started looking for other ways to move their careers, Eileen Collins, the first woman to command a space shuttle, was the only female T-38 instructor on Peggy’s base, and Peggy was there! Peggy’s positive attitude has served her well, through a great career in aviation. One of the biggest obstacles she had to overcome was her own mindset. When she began, she didn’t think she was capable of some things, didn’t think she was good enough, didn’t think she had the potential, and would sell herself short. Additionally, she was raised thinking her options were to become a schoolteacher, nurse, or secretary. Peggy really shifted her trajectory with pilot training, where she decided she was going to put in her full effort and be as good as she could be. She knew she would either make it or not, and that it was up to her. She eliminated the thought that had crossed her mind many times – the thought that she is a woman and shouldn’t be there. Peggy shifted that by telling herself that she had every right to be there; every right to be like the others who were there. If she was not good enough it was not going to be because of her gender. Today, when Peggy looks back she realizes the societal changes and how opportunities have progressed for women. The mindset of women had also changed in how they view themselves, and women still have a ways to go. It takes several generations. Peggy’s insights and perceptual filter shifts inspire and empower those following in her footsteps. She has trained many cadets and has helped them with their mindset – they are worthy and can be a great contributor to the Air Force, even if they are not the best graduate in their Academy class. She did it, and they can do it too! Peggy would not change a thing from her past experiences. They have all contributed to where she is today, and she is happy where she is. Peggy overcame obstacles and shifted her mindset to a positive one, and as a result, became a pilot trainer pioneer to pave the path for other women to have an opportunity to fly military aircraft for their country and is considered a “warrior” for women and their advancement. Additionally, because of her positive attitude, she has had incredible opportunities to witness some important events in history, such as the awarding of the Congressional Gold Medal to the Women Airforce Service Pilots (WASP), her mentors. In the course of her military and commercial flying careers, she has had the opportunity to brush shoulders with aviation legends such as General Chuck Yeager, as well as notable persons in the worlds of politics and entertainment. Then Vice-President George H.W. 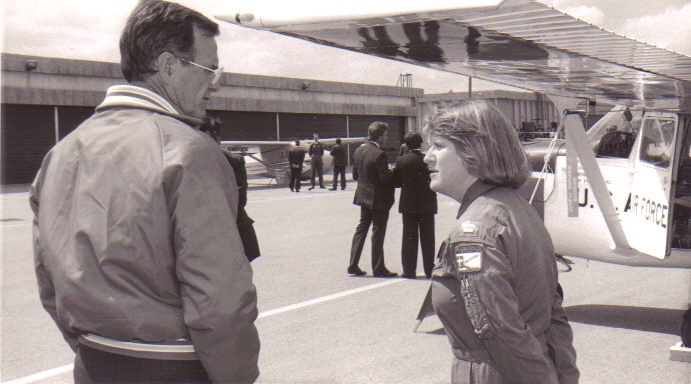 Bush and Margaret “Peggy” Dennis Carnahan at USAF Academy Graduation , May 21, 1986. (T-41 in background.) Courtesy of Captain Margaret “Peggy” Dennis Carnahan. About Margaret “Peggy” Dennis Carnahan: Peggy is a native of Momence, IL. 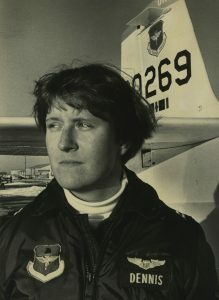 She graduated from the United States Air Force Academy in 1980, a member of the first class to include women. After receiving her USAF Pilot wings as a Distinguished Graduate, Peggy remained at Vance AFB in Enid OK as a T-37 instructor pilot. Her follow-on assignment was back to the USAF Academy as a T-41 instructor pilot where she also helped coach the women’s rugby team. In February 1988, she transferred to Randolph AFB, TX to work as a courseware developer and a T-37 instructor pilot, this time teaching new instructors. After attending Air Command and Staff College at Maxwell AFB AL, Peggy next served at the Pentagon in various positions, culminating in being the executive officer at the Directorate level. She concluded her military career back at Randolph AFB as the Operations Officer and then Commander of the 559th Flying Training Squadron, and as Deputy Commander of the 12th Operations Group. Following her retirement as a Lieutenant Colonel in August 2000, Peggy and her husband moved to southwest Missouri where they raise registered Black Angus cattle. She soon accepted a pilot position with American Airlines, but was furloughed in March 2004. Later that year, she joined NetJets Aviation where she has remained, flying the Citation X, Citation Encore and the Phenom 300. Peggy remains an active member of Women Military Aviators, heading their social media efforts, and teaches Leadership in Warfare in the USAF’s Online Masters Degree Program. About Fire Power Seminars: Founded in 2006, Fire Power Seminars’ mission is to empower individuals, organizations and companies to achieve more than they ever thought possible. The company provides transformational experiences that are remembered for years to come through their experiential communication, empowerment, and team building programs that empower and inspire organizations and individuals to realize their full potential. Our customized programs include board breaking, arrow breaking, and firewalking. For more information about Fire Power Seminars, call 954-232-4486 or send an email to Karen E. Pfeffer at Karen@FirePowerSeminars.com. 10+ years passionate about sharing powerful programs on communication, empowerment, team building and transformation. With a father from Kansas and a mother from Puerto Rico, Karen has a unique cultural mix that has inspired her to challenge stereotypes and “push the envelope” at every opportunity. She co-founded Fire Power Seminars with Connie Phelan in 2006 to empower individuals, organizations, and companies to achieve more than they ever thought possible.